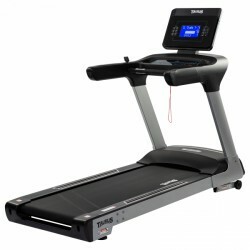 The Taurus Treadmill T9.9 offers cardio training at commercial level. The treadmill is extremely loadable and is equipped with a powerful motor. The running mat lasts very long and improves the already excellent suspension system. Additionally you can connect your mobile device to the treadmill with compatible treadmill app for an interactive training session. The Taurus T9.9, in the standard model, has everthing a runnner could wish for: a large running area, a powerful motor and easy to use. The T9.9 offers an especially stable finish and is able to hold a max. user weight of 190kg. The running mat is thick, which gives numerous advantages, one for example giving better cushioning. The treadmill has a large running area, which makes for better training. Especially taller runners can comfortably train on the treadmill and also useful when training at high speeds. The Taurus Treadmill T9.9 reach speeds up to 22km/h! The Taurus Treadmill T9.9 is programmed with meaningul training programs. Not only can you choose from one of the pre-set programs, that can simulate walking on the hills for example, but you can of course use the manual mode or heart rate programs which also are available. Setting your training speed and incline can be easily changed at all times. 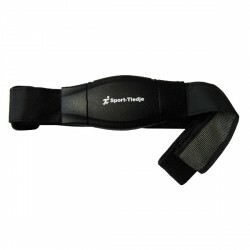 Each has 8 hot keys which allow you to quickly change your training how you want to! Brand new is the Bluetooth recevier. Thanks to this you are able to connect your smartphone of tablet. Make your training more interactive together with a compatible treadmill app. You are able to run real world routes and have even more detailed analysis possibilities. You can even charge your mobile device directly with the built-in USB port. Taurus lange håndtak til tredemøller På lager! 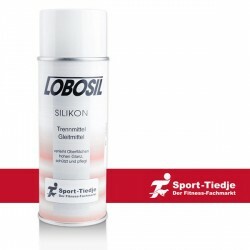 Sport-Tiedje Komfort Brystbelte Premium På lager! Kinomap - Fitness and Training App På lager! Taurus beskyttelsematte str. 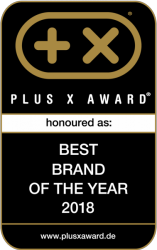 XXL På lager! 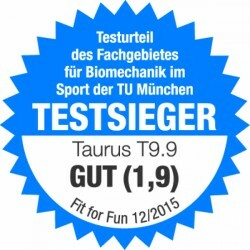 Taurus Treadmill T9.9 legge til i listen med sammenligninger .